Over the last 10 years, I have gone through the highs and lows of running businesses. I like to be as transparent as possible, and I talked about businesses that have come and gone in my book. I realised just last week that I hadn’t actually shared the success I have around generating online revenue, and the sources I use to achieve this. 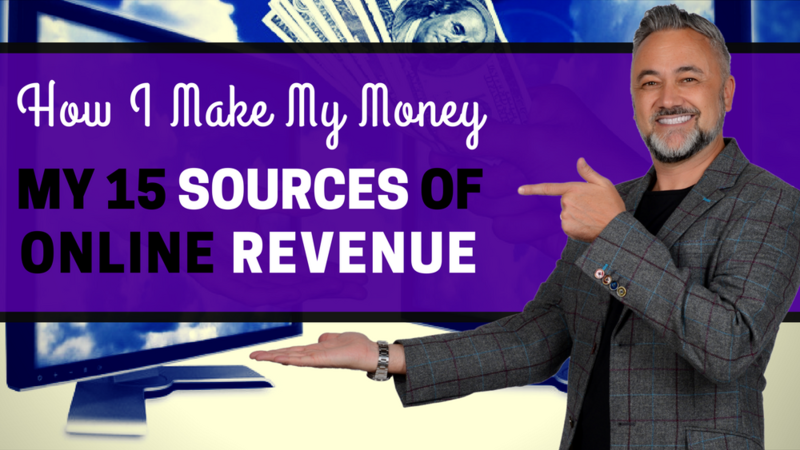 So… here is how I make money, and my 15 sources of online revenue. When I get paid to speak at events as a keynote speaker, it does make me smile. Professional speaking is my favourite “thing” that I do, and to know that I can get paid to travel around the world, and talk about what I love is really a dream come true. It’s not something that happened overnight. It took me years to establish myself as a professional speaker, and to get to that point, I had to do a lot of public speaking. Whilst the bigger revenue driver is the professional speaking gigs that I book, to get to that point, I had to do a lot of public speaking. Whilst I wasn’t being paid to speak, I was still given the option to up-sell my products or service at the end of any of the public speaking engagements I would take part in. I have also won paid speaking gigs from people who were in the audience or through recommendations from seeing me speak for free. Over the last nine years, I have been hired by various size companies from small businesses to corporates to train their staff, develop programmes, and work with employees on a regular basis. This will cover all areas to do with going through a digital transformation using social media & digital marketing. I currently have five Elearning online courses that I run throughout the year, and have hundreds of my audience taking part in. This has been a new online revenue source over the last two years, and it has been extremely successful way of sharing my knowledge at a cost effective way for startups and corporates wanted to train lots of their staff at different stages throughout the year. For the past 18 months, I stepped outside of my comfort zone, and become a “lecturer” at universities and business schools all around the world. When I first started doing this, I was nervous as this was something I had never done before, and it was out of my comfort zone (although I do speak to thousands of people on a regular basis). The thought of taking something that I do with corporates and SME’s and then repurposing it so that it resonates with students, was going to be a challenge. A couple of the places I’ve worked with in the last eight months are; INSEEC (a private French business school in London with French & International students) and AUST (American University of Science and Technology) based in Lebanon, Beirut. The coaching programs I deliver are based on a 6-12 month basis, with clear goals and outcomes for every session. Because of the trust I have built online, I have regular coaching clients that I work with both online, and face-to-face to implement actions over the coaching period. Mentoring is all about working 1-1 with a business owner, entrepreneur or expert over a long period of time. I offer guidance and often work as a sounding board for my mentoring clients. I have been offering whiteboard strategy sessions for a select few businesses. I will get their team together to focus on the business, looking at the people, processes and technology. My strategy sessions are created to facilitate brand awareness building, and to look at new revenue streams. My whiteboard strategy sessions are educational, interactive and completely facilitated by myself. Social Media Management was something I used to do a very long time ago, and as I got busier over the years, it became less of a revenue stream for me, until now. I have understood what my audience want from me, and part of their pain, is wanting someone to manage their Social Media. If this is something you are interested in, please answer the 30-second survey here! When I wrote the first edition of Think #Digital First back in 2014, I knew that I had a large potential revenue stream, because of the large database I have, and the partnerships/affiliates that I worked with on a regular basis. This, combined with 5* amazon ratings, meant that my book was achieving a large amount of success, and since the launch of the second edition earlier this year, I have been able to achieve the same. When I come across a person, company or service I feel matches my core values and will add value to my audience, I will engage with that brand on a partnership/affiliate basis, I like to call them my “channel partners”. This is not always a monetary gain it can often be an awareness and lead generation gain, which ultimately leads to sales. When you do build a personal brand online and have over 100,000 followers on Social Media, being a brand advocates can become a powerful online revenue stream. A brand advocate is someone who is not directly paid to speak about your business, but will happily talk about their positive experiences with the brand, to their audience. When doing this you must make your audience aware you are “promoting” a business. Being an influencer, usually means that you have sway over a large demographic, and because of this; companies want to pay you to talk about them. This isn’t really a route I tend to go down, but I will talk about the businesses I truly believe in on my websites, blogs, and book. Because of this, some of the companies will reach out to me as an influencer, and give me a free subscription to their technology. This, in turn; saves me money. This is where I will work with an organisation, and they will pay me to contribute to their blog, or magazine. I am a contributor to Social Media Examiner, Social Media Today, and Business2Community. All three of these websites drive an enormous amount of traffic back to me, which does generate revenue. I write on Think Digital First and Warren Knight once a week. The continuous unique content gives me more traffic to my websites, and also helps generate business for me. I will run webinars to my audience on a regular basis, and at the end I will always up-sell a product or mine. The webinar will be based on the topic of said product. When I work with partners, I will run webinars. Because they will be emailing their database and not mine, this not only drives me online revenue, but new customers. I would love to know what your sources of online revenue are, and if by sharing my revenue streams, you have new potential earning possibilities!